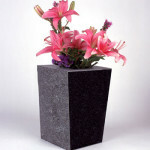 Memorial Vases are available in many different colors, shapes and sizes. Below are examples of the most common. Please ask your memorial adviser for more options.